Today will be the final day of our rafting trip retrospective. So before we left on our vacation, Kristine mentioned that if we were going to be up in Northern California, would it be okay to visit a waterfall she saw on a bank calendar? I was a little skeptical that the waterfall would be worth the extra trip, but I was up for more time outdoors, so I arranged for a final night after rafting at McArthur-Burney Falls Memorial State Park. I am so glad we made the trip. I know my photo won't do it justice, but it was perhaps the prettiest waterfall I've ever seen. If you went up stream from the falls you wouldn't think it was possible. The photo above shows the creek just before the falls! So where does the water come from? It actually flows underground through the volcanic basalt rock and then comes pouring out of the side of the rocky cliff wall at the same spot that the creek flows over the top – 100,000,000 gallons a day! Everything about the park was great! Great natural features, beautiful flora, and it was kept up very nice for a state park with new facilities designed in the same beautiful rustic architecture of the 1920s to 1940s. Jonathan took this one. I think he has a natural eye for composition. One of the best things about our time was just hanging out together as a family. 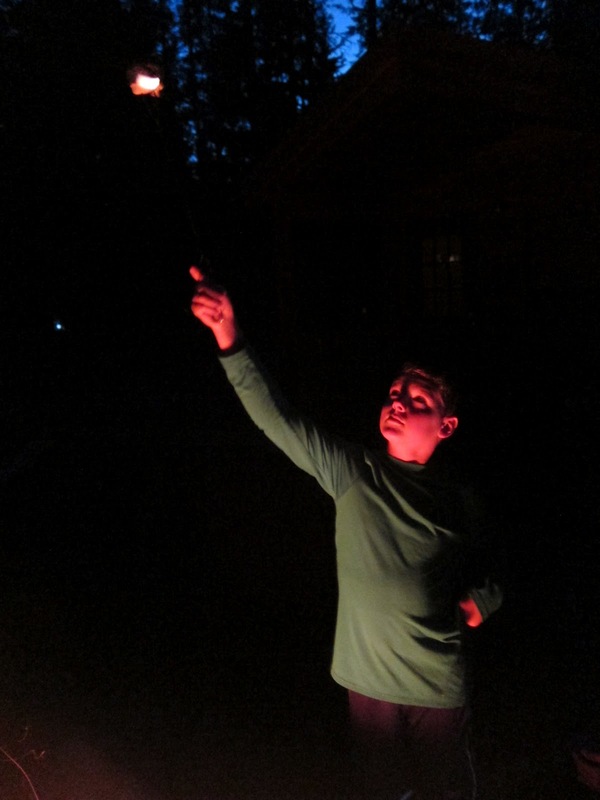 Toasting mellows around the fire. Oh, and last but not least, there was the obligatory welcome to the state freeway sign photo in Oregon. How can you not, when you're only a 15 minute drive away? Good choice, Kristine! I need to put Burney Falls on my Bucket List. That Lava Cave looks like an ice cave. The floor is so smooth. Not like the Lava Tube Cave north of Flagstaff AZ. If only more families could take trips like you do. Great post, Nate. 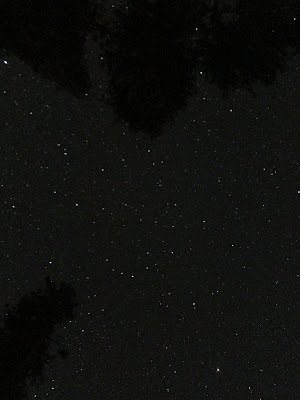 I especially like the starry sky photo. I see Hercules, Corona Borealis, and Bootes...very nice! I had to squint to see Jonathan in the picture with the statue. What a great trip and your children will have such wonderfull memories. Thank you for sharing. 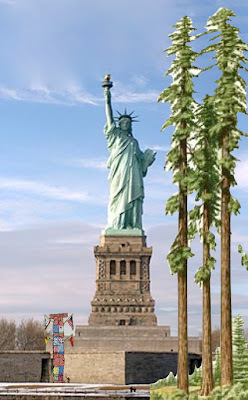 It's getting crowded on Liberty Island... You've never seen the Niagara Falls (or didn't you like them)? Rob, yes, I have seen Niagara Falls. I found them quite lovely and was in awe while watching the volume of water going over the top. However, Burney Falls had an intricate and delicate beauty that Niagara does not have. Perhaps I should say that Niagara is the most powerful waterfall I've witnessed. Yosemite Park (closer to home for me) also has some beautiful falls and some favorites of mine. good The request brand possesses a drop down rundown from official latest app From the adjustments decision attainable at the Mobdro App nice. Download mobdro new entertainment application from the official site mobdro homepage from here. good a fresh package will show up, right here, you possess to press on Install. Install Show-Box Addon Kodi If you experience any difficulty while putting in or nice. good very much in the same method you give things to an advisor." Snapchat Ghost Emojis to worry over a month to month a regular membership nice. good a genuine picture is inside it comprehending that they're Wedding Photography in Ahmedabad | Wedding Photography in Vadodara | Wedding Photography in Surat your companion as well as you create your personal nice. good them with you if you're taking a trip somewhere without a web connection. Best Kodi Addons also you could find it in the brand-new Plex for Kodi online forums great. good video clips, songs, papers, as well as folders. shareit iPhone as well as iPad. Shareit makes it possible best.